Ten weeks ago on 3rd January, we’d beaten Fulham at home 4-1 a couple of days previously and City had just beaten Liverpool (still the scousers only defeat of the season). We sat 7 points behind the spuds and 3 behind the chavs in the Premier League. According to the stats chaps we had a 1 in 3 chance of finishing in the top 4. The spuds sat on 90% chance and chavs 70%. 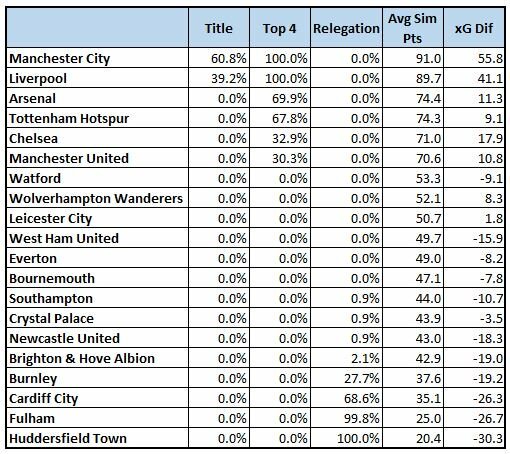 Our simulated end of season points total was 71 points, 8 less than the spuds and 4 behind Chelsea. Since then we’ve caught up 6 points on both of our London rivals, including picking up maximum points at home to Chelsea and Man U and gaining a creditable (and a touch unlucky to be only a single) point away at Wembley. The race for the top 4 has opened up with the red mancs having marginally better form than us over those same games. Thankfully the steam appears to be evaporating slightly from the OGS express with back to back defeats. Since early January our chances of achieving that top four position have, apparently, more than doubled . Meanwhile the spuds’ chances have dropped from 90 to just under 70% and chavs from over 70% to just less than 1 in 3. 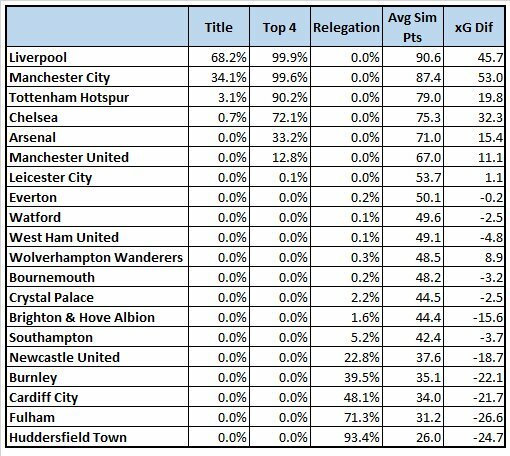 I’ve seen comments on twitter under the second projection saying, ‘this is basically just the League table, isn’t it?’. Of course it’s fine to think like that about attempts to try to statistically analyse a game involving 22 chaps, a pig’s bladder and a man and his buddies dressed in black (or green), all being of indeterminate parentage. Anyway, moving on to the fun part. 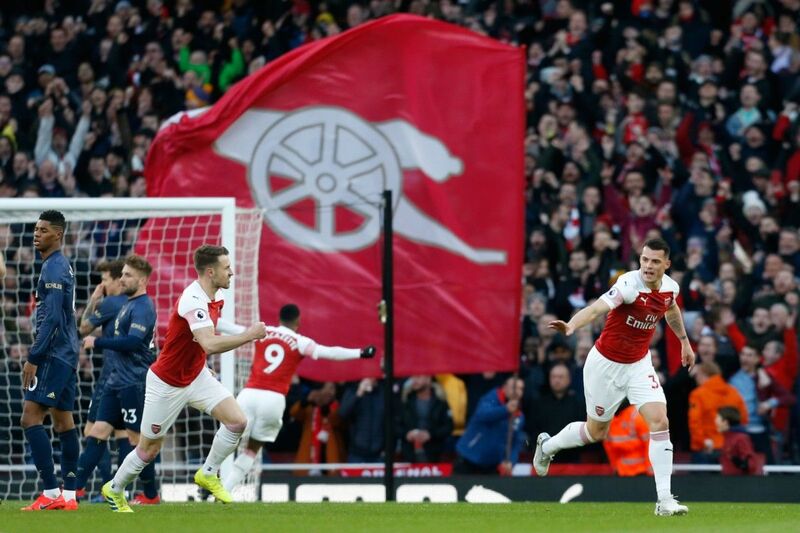 Optimism is high in the Arsenal camp at the start of the interlull having disposed of Rennes and the resurgent mancs in the past week but with 5 away games left of our remaining eight, there are sure to be some ups and downs in the weeks to come. Wolves away (the game postponed because of their FA Cup game last weekend) has been been rescheduled for Wednesday April 24th and we’re sure of a hot reception at Molineux under the floodlights. What other factors need to be taken into account for the run-in? Your thoughts in the comments below, please. This entry was posted on Wednesday, March 20th, 2019 at 7:52 am and is filed under Uncategorized. You can follow any responses to this entry through the RSS 2.0 feed. You can leave a response, or trackback from your own site. Actually I was looking forward to it. So, big question, can we improve our away form, and if so, what is it that will make that difference? I don’t know what Unai has said or done, or what may have finally clicked inside the welsh belfry, but we finally have a system that works for, or with, him. Compound this transformation with another apparent revelation on the part of Unai. We’ve stopped chucking away leads. How? Attack more rather than sit on a lead. Chas. Great read.I don’t do speculation, more of a Carpe Diem, Live-in-the-Day type of chap. Any predictions I have made in life, particularly regarding economic issues (shares etc) have gone spectacularly wrong :-(. The pendulum really is swinging backwards and forwards. We are well in course for forth at the moment. Why has Mick Jagger changed his hair and become a woman? With the new found formation from emery, and the form and parfomance of niles, At the right handsite!Am optimistic of finishing 3rd. And, Jeremy Corbyn with a bow tie? Thanks Chas … I voted 3rd. I can see the totts and manu imploding (possibly the chavs too). I have great faith in Unai, he’s a very clever guy. Like most, I am now lamenting Ramsey’s departure … he could be the driving force behind our thrust for top 4 and the EL, he clearly wants to leave on a high. I’m dreaming now, but wouldn’t it be great if he scored the winning goal againrt the chavs to win the EL? We still don’t have a director of football … so replacing Aaron should be high on our list for the summer. If we finish Top 4, I am happy. At the moment, we have the upper hand for 4th place but we know our team, we can also choke and not perform against so-called weaker opposition. I think we should finish 4th but having been let down the last few seasons, I d say we will finish 5th based on recent past experience. Can’t believe how many optimists there are out there – 3rd? I thought I was being gung ho voting 4th. – Hazard with a bid at 100 Mln touted or 1 player + fee. The Real Madrid transfers are going to have knock on effects on the whole transfer market because key players will be moved around and much money will be spent. Similarly, Bayern is also looking for a big summer with moves for Pepe (Lille) in the pipeline to replace Ribery and Robben. I am surprised RM are interested in a MC reserve (Mahrez). Hardly a replacement for Bale who is head and shoulders the better player. Maybe they should try and sign Sanchez from MU. Big Raddy – if Zidane fails to sign Hazard and/or Mane, then Mahrez is not a bad option. I do not think they will get Neymar or Mbappe this summer, maybe next – who knows? RC. I think RM’s problems lie in the age demographic of their team. They just have too may players with too many kilometres on the clock. Modric is finished, Ramos is done, Bale, Benzema, Kroos etc. They have to completely rebuild and my expectation is that Zidane will sign younger players than Mayrez (28). One of the young English boys could be a target Hudson-Odoi or Jadon Sanchez. Well this Poll question has seriously discumknockerated this blogger i.e. me. I suspect that no one on AA would just make a wild, unsubstantiated guess as to the position in the League that we (Arsenal) would finish, and therefore if challenged as to how they arrived at their meticulously calculated answer they could and would and frankly should, be able to give a mathematically or scientifically accurate outcome capable of quod erat demonstrandum which would remove any tiny inkling of simple lazy guesswork. Let’s face it — Captain Micky would not tolerate that! I resorted to my usual fallback in answering such questions, requiring a precise prediction reflecting some merit of of respectability — Einstein’s theory of general relativity. Let’s see. E=MC — Energy = Mass * the square of the speed of light. Perfect. As you all know, the earth travels around the sun at approximately 67K miles per hour. So, if we sit on a train, Micky, and bounce a micro football-like object such as a table tennis ball on the same spot, while travelling at 20mph the said pill would appear to be travelling at the same speed as the earth, which is to say from the first bounce to the second or third the ball has only moved vertically and not horizontally, while you and I Tricky Micky, would be resting in an apparent state of luxurious inertia. However, LB, travelling on his bike, alongside the train, at the same velocity as the train, as borne out by his overworked lungs, will testify that he, and the table tennis ball, would have travelled 50 metres from the start of the first bounce. So, I have calculated how much every football in the premier league has potentially moved forward, backwards and vertically over the last 8 matches and applied the theory of relativity which shows the answer I have is …………. I do not have a clue. I tried E-MC but the disappeared. Bow Locks! I went for 3rd, being an optimistic f*cker. Up to Islington on the train tomorrow from South-East France. for the weekend, my mum’s 90th birthday. No footie on (worth mentioning) but it’ll be good craic. Not sure about postage this morning. GN5 has sent me one which I haven’t had time to format. Can’t see anything in Nuts. I’m off marking this morning first thing. 6.36 Superb. Sadly ,we don’t get Partridge over here. I’m going to switch from satellite to fiber optic today so I will be going AWOL.